I don't know about you guys, but lately I've been an emotional mess with all of the bad news circulating. Not to be dismissive of the current and real struggles people are facing, or the tragedy of people losing their lives in senseless manners; but it has been extremely draining day to day. Sometimes we need a little positivity break. When I saw this video I immediately was interested mainly because it had to do with a kids choir singing to their teacher. Right off the top you think, "Oh thats so sweet!". Once you open the video and start watching it the sweetness goes to a whole other level. 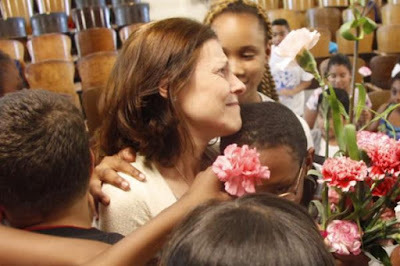 The children at the PS22 in Staten Island dedicated a tear jerking performance of Martina McBride's "I'm Gonna Love You Through It" to their teacher who is battling cancer. It's their commitment to sending her love and support through her difficult time. I cried watching this for a few reasons. The whole idea of a loved one battling cancer is home for me, the children are singing with such passion, and the teacher is in pieces immediately. The point that drove this video home for me the most though is the reality that loving one another seems to be such an abstract idea these days. People of today need more of this in many different situations. It just rings so true considering all of the hateful acts happening around the world. Enjoy this beautiful song by these little angels. I recommend you get some tissues before watching this.